Swei, A., Couper, L.I., Coffey, L.L., Kapan, D., Bennett, S. In review. Patterns, drivers, and challenges of vector-borne zoonotic disease emergence. Greer, J.A., Swei, A., Vredenburg, V.T., Zink, A.G. In review. Insect parental care alters egg microbiome structure and function. Emery, N., Hund, A., Burks, R., Duffy, M., Scoffoni, C., Swei, A. In review. Students as ecologists: Strategies for successful mentorship of undergraduate researchers. Owens, M.T., G. Trujillo, S.B. Seidel, C.D. Harrison, K.M. Farrar, H.P. Benton, J.R. Blair, K.E. Boyer, J. Breckler, L.W. Burrus, D.T. Byrd, N. Caporale, E.J. Carpenter, Y.-H.M. Chan, J. Chen, L. Chen, L.H. Chen, D.S. Chu, W.P. Cochlan, R.J. Crook, K.D. Crow, J.R. de la Torre, W.F. Denetclaw, L.M. Dowdy, D. Franklin, M. Fuse, M.A. Goldman, B. Govindan, M. Green, H.E. Harris, Z.-H. He, S. Ingalls, P.D. Ingmire, A.R.B. Johnson, J.D. Knight, G. LeBuhn, T.L. Light, C. Low, L. Lund, L.M. Márquez-Magaña, V.C. Miller-Sims, C.A. Moffatt, H. Murdock, G.L. Nusse, V.T. Parker, S.G. Pasion, R. Patterson, P.S. Pennings, J.C. Ramirez, R.M. Ramirez, B. Riggs, R.V. Rohlfs, J.M. Romeo, B.S. Rothman, S.W. Roy, T. Russo-Tait, R.N.M Sehgal, K.A. Simonin, G.S. Spicer, J.H. Stillman, A. Swei, L.C. Tempe, V.T. Vredenburg, S.L. Weinstein, A.G. Zink, L.A. Kelley, C.R. Domingo, K.D. Tanner. Collectively Improving our Teaching: Attempting Biology Department-wide Professional Development in Scientific Teaching. CBE: Life Sciences Education. March 1; 17(1):ar2. Swei, A. and J. Kwan. 2017. Tick microbiome and pathogen acquisition altered by host blood meal. The International Society for Microbial Ecology. 11: 813-816. Swei and Kwan 2017 PDF. MacDonald, A.J., Hyon, D.W., Brewington, J.B., O'Connor, K.E, Swei, A., Briggs, C.J. 2017. Lyme disease risk in southern California: abiotic and environmental drivers of Ixodes pacificus (Acari: Ixodidae) density and infection prevalence with Borrelia burgdorferi. Parasites & Vectors. 10:7. MacDonald et al. 2017 PDF. Bouquet, J., Soloski, M., Swei, A., Cheadle, C., Federman, S., Billaud, J., Rebman, A., Kabre, B., Halpert, R., Boorgula, M., Aucott, J., and Chiu, C.Y. 2016. Longitudinal transcriptome analysis reveals a sustained differential gene expression signature in patients treated for acute Lyme Disease. mBio. 7(1): e00100-16. Bouquet et al. 2016. June 21, 2018 -- CSU newsletter coverage of the NSF CAREER award winners throughout the CSU system. SFSU won half of all of the CSU-wide awards including two in the Biology department! May 4, 2018 -- News coverage of Alexandra Lawrence's study in Ecosphere was published today in the San Francisco Chronicle! 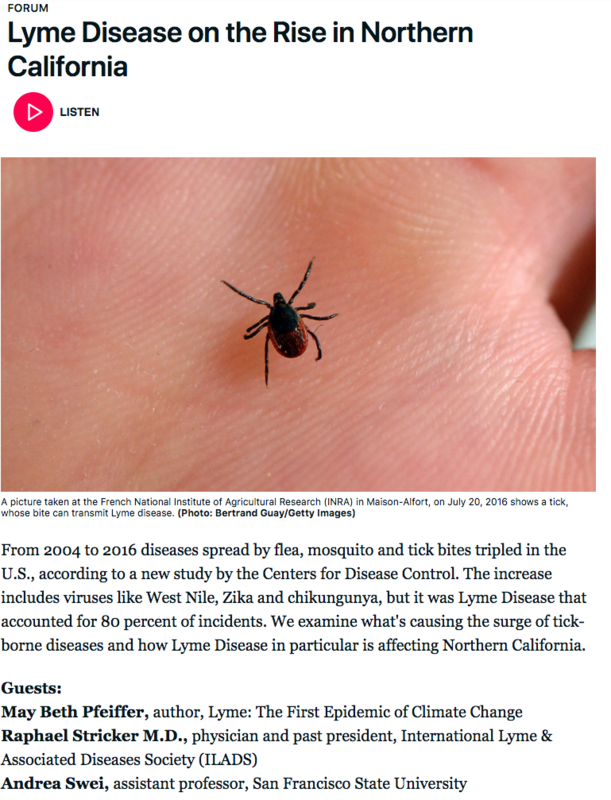 KQED Forum did a show on Lyme disease emergence! Dr. Andrea Swei was on the panel and discussed the ecological factors influencing tick abundance and risk in the San Francisco Bay Area. Members of the Swei lab worked an outreach table at the California Academy of Sciences Nightlife event. March 26, 2018. Science night, hosted by the SFSU chapter of SACNAS. Master's student, Arielle Crews, talks to an elementary student about ticks. September 27, 2017.